The white, quartz-capped mountain is the prominent landmark of Mount Ophir, whose site is easy to miss as it is no longer on Hwy 49, but on a bypassed segment of the old road. The first gold in this area was discovered by Mexican miners in 1848, who reportedly took out $217,000 worth in one week. Originally christened Ophir in 1851, the camp's post office was established under the same name on February 20th of 1852, only to be amended to Mount Ophir on November 3rd of 1856. This was most likely done to avoid confusion with the mining camp of the same name near Auburn in Placer County. Standing near the small stream which runs through Mount Ophir, it's hard to imagine that at one time a sawmill, twenty-four steam driven stamps, a quartz mine, hotel, stores and cabins once existed on cleared land here in the late 1850s. And while there are only a few ruins left to mark the site of this once prosperous camp, it's a great spot to experience the effects nature must have had on the miners of the Gold Rush. Stewart White describes one effect well in Old California: "No one who has not experienced it can begin to realize the power of the midsummer sun reflected back and back again from canyon wall and naked rock. The very lizards gasp." Visit the site on a hot summer day and place yourself in the miners' boots, levis and flannel shirts, working without benefit of shade as all the trees had been cut down for lumber and firewood. It wasn't an easy way to make a living. But the promise, or rather, the possibility of gold, was enough to make the miners forget their discomforts and concentrate on the job at hand. The Mount Ophir Ruins consist of a two-story structure, of which only parts from the side walls remain, and various and assorted foundations and wells which lay scattered about the site. The two-story ruin was built in 1853 of quarried slabs of locally mined schist set in mud mortar. It originally had a slate roof which made it almost fireproof, a valuable asset during the early years of the Gold Rush. The building was used as a trading post and was quite well established, being patronized by the miners of the area, as well as packers traveling through on their various routes through the Southern Mines. Louis Trabucco left his home in Richmond, Virginia, in 1850 to make his fortune in the gold mines of California. Traveling aboard a wagon train, Trabucco arrived in California after a somewhat perilous journey, first settling down in nearby Hornitos where he tried his hand at mining with little success. In 1854 Trabucco purchased the well-established trading post at Mount Ophir, where he was able to make a much better living providing goods and services to the surrounding area. Assorted Ruins are scattered about the area here, on both sides of the creek. Most of the area is private property, however, so don't wander and pay attention to posted signs. 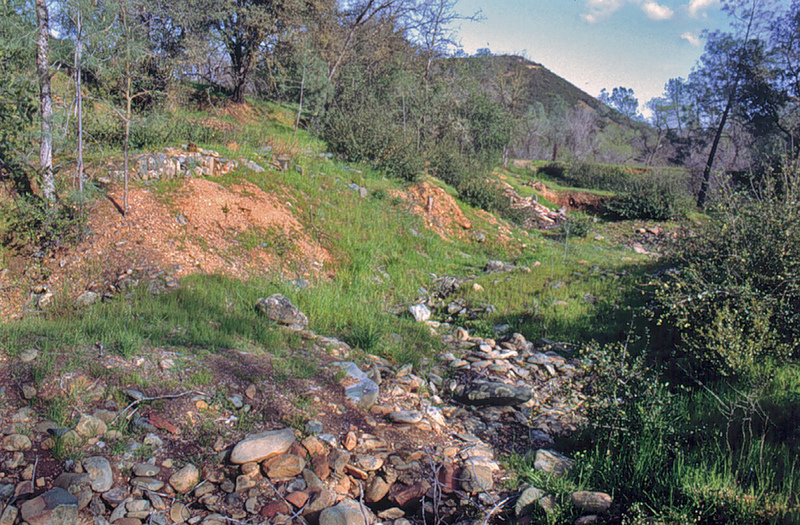 One of the famous legends that surrounds Mount Ophir is that one of the ruins here housed a private mint operated by John L. Moffat, where he 'supposedly' struck some of the famous octangular $50 gold "slugs" prized by collectors of California Territorial Gold. Alas, this is not so. While Moffat was a major stockholder in the Merced Mining Company, which had purchased "Quartz" Johnson's Mount Ophir mine on March 4th of 1851, there is no evidence to support the story of a mint being located at Mount Ophir. The confusion probably arises from the fact that while Moffat was an owner in the Merced Mining Company, he was also still the principal in Moffat & Co, a private mint located in San Francisco which was producing the $50 gold pieces under contract for the U.S. Assay Office. A Stone Mounument sits near the side of the old road.